Bangalore: The arrest of B.S. 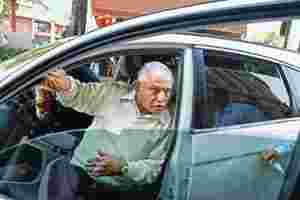 Yeddyurappa on Saturday capped a remarkable three months for Karnataka’s ruling Bharatiya Janata Party (BJP), during which a notable section of its state leadership has been incarcerated or come under investigation for alleged corruption. Yeddyurappa’s fall from the chief minister’s post, which he had held until 4 August, to undertrial no. 10462 at Bangalore’s central jail also reflects how intertwined politics and business have become in the southern state. In particular, Yeddyurappa ordered the denotification—or return of land acquired by the state government to the original landowners—of several acres in and and around the city. Documents filed in court allege that in return for these decisions, a portion of this land was either sold back to firms owned by Yeddyurappa’s family below market rates, or payments were made to these firms for the denotification order. Two firms, Davalagiri Property Developers Pvt. Ltd and Bhagath Homes Pvt. Ltd, both promoted by Yeddyurappa’s sons and son-in-law, are alleged to have benefited. For instance, Yeddyurappa denotified more than 2 acres in Agara village (Bangalore), which was then sold by the original landowners to a firm owned by real estate developer S.S. Ugender. Documents filed by the lawyer showed that Ugender had paid ₹ 2 crore to Bhagath Homes a few months before the denotification order. Over the past three months, seven former and current ministers have either been brought under investigation or have been put on trial on charges of corruption. Most of these cases involve decisions taken by them favouring business interests—often their own. B.L. Shankar, a former chairman of the state legislative council and a member of the Janata Dal, said politicians are increasingly finding themselves in conflicts of interest. “Business and politics have become dangerously intertwined in the state. Many ministers are exercising powers in areas in lieu of monetary benefit, which would have been unthinkable in the past," he said. Besides Yeddyurappa, former housing minister S.N. Krishnaiah Setty was also arrested on Saturday in a land case where he allegedly benefited from a decision taken by Yeddyurappa. The Reddy brothers of Bellary—G. Janardhan Reddy, G. Karunakara Reddy and their aide B. Sriramulu—were dropped from the new cabinet headed by chief minister D.V. Sadananda Gowda after their names featured in the Lokayukta’s mining report this year. Janardhan Reddy was also arrested by the Central Bureau of Investigation (CBI) in connection with illegal mining. Former information technology and biotechnology minister Katta Subramanya Naidu was arrested by the Lokayukta police in August on charges of accepting a bribe of ₹ 87 crore from a software firm in return for allotment of 325 acres near Bangalore. Forest minister C.P. Yogeshwar has been charged by the Serious Fraud Investigation Office (SFIO) of cheating and fraud in relation to a real estate project undertaken by him. The consequences of these decision have not been slight for ordinary residents, and many are fighting for their rights. For instance, in late 2010, Yeddyurappa passed an order making it legal for housing societies to allot land to “associate members". This rule enabled a plot of nearly 1,500 sq. ft to be allotted by the Vyalikaval Housing Society to Davalagiri Properties, according to a Tehelka report in December. However, Vyalikaval Society has hundreds of applicants waiting for their sites for several years. Shripathi, a 64-year-old retired army employee who uses only one name, said he has been waiting for a site since 1980. “I paid nearly ₹ 2 lakh just before I retired in 1981, and since then the society has been promising to allot the plot one way or another. We were in the dark all this time," he said. According to a writ petition filed in the high court, nearly 90% of applicants have not been allotted plots, while several associate members have received them. Sandeep Shastri, a political analyst and pro-vice-chancellor of Jain University in Bangalore, said Karnataka has seen three phases in the relationship between politics and business. “Earlier, business interests such as the liquor lobby or the education lobby influenced politics by funding candidates across parties, but were never part of the political process per se," he said. This gave way to businessmen becoming a part of the political process by contesting and winning legislative assembly elections, but they did not occupy a government position. Over the past decade, however, people representing business interests have taken the final step by formally joining the government, Shastri said. “These members began asking why they should not be part of the government when they were already calling the shots." This has been true of the coalition government of the Bharatiya Janata (BJP) and Janata Dal, (Secular), or JDS, (in 2006-07), the Congress-JDS coalition (2004-06), and the Congress governments (1999-2004), he said. Public concern over corruption has also increased. A survey in August by the Centre for the Study of Developing Societies asked respondents whether the Union, state or local government was the most corrupt. Around 52% of those surveyed from Karnataka said their state government was the most corrupt, followed by Andhra Pradesh at 39%. Vishnu Kamath, one of the petitioners in the Supreme Court mining case, said he decided to take the legal route after the state government did nothing with the first Lokayukta report on illegal mining in 2008. “Illegal mining continued despite that report, so we felt we could not sit still," he said.